Contact the owner at 631-433-six zero five nine... 2004 Meridian 381 Sedan Bridge. Fresh Water boat till 2013. 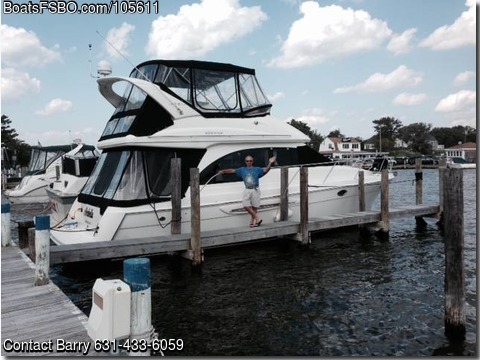 Large Galley with refrig and freezer, ice maker, cherry wood cabinetry throught the yacht, full head with shower,tub stall. Roomy comfortable salon with sofa that converts to a bed. Forward master berth , gust stateroom with double bed. Large Bridge that will easily accomidate 8 people and features a four sided enclosure. Molded fiberglass staircase from rear deck to the bridge. Meridian docking on command with bow and stern thrusters. Powered by twin Mercruisers 8.1L 420 HP engines. 10KW Kohler generator/ Garmin 700 series GPS chart plotter unit/ VHF Radio/ electric anchor windless/ Direct TV trackvision/ new salon air conditioner/ yard maintained. For additional pictures please text request with e-mail address.